The Workshop of the Pottery School is housed on the ground floor of the barn with delightful brick arches spanning the length of the building. 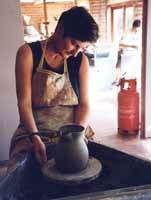 It is fully equipped with potters wheels, kilns, all the tools and machinery that a working pottery needs, leaving it only for you to bring an overall of some kind, a pair of jeans and an old towel. Martin Homer who together with his wife Tina runs the courses has been potting for many years. 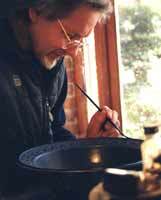 He trained as a potter at Bournville and Birmingham schools of art. 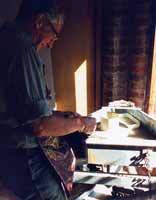 As an established potter he makes a wide range of both domestic and individual pots, mainly in stoneware, selling these through his shop in the nearby town of Ludlow.